"41MR12, Burial area/line of artifacts, 40" by Timothy K. Perttula and Robert Z. Selden Jr. 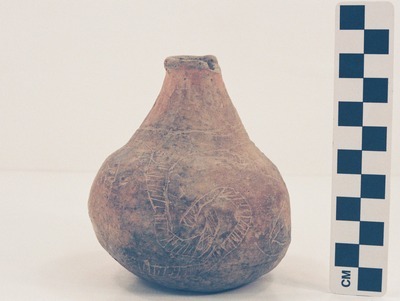 VESSEL FORM: Bottle with an inverted rim, and a rounded and exterior folded lip; the bottle body is squat and heavy. DECORATION: the body has four repeating sets of intertwined hatched scrolls, not particularly well executed.